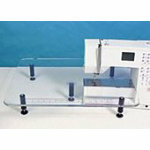 For Bernina models 130, 131, 140, 150, 153QE, 155, 160, 163, 165, 165E, 170, 180QE, 185E, 185QEE, 200E, 730E, for free arm use no embroidery These tables are special order and nonreturnable. Please make sure the model number is correct. Billable transportation charges for freight intensive items will be the greater of the dimensional weight compared to the actual weight. In addition to transportation charges, freight carriers may assess an additional oversize charge per package.